An Artist's Brush Reveals Tales Of Struggle And Survival : Shots - Health News There's a story to tell about every family's encounters with the health care system. Some are tragedies. Many are a blaze of enduring hope in the face of suffering and loss. 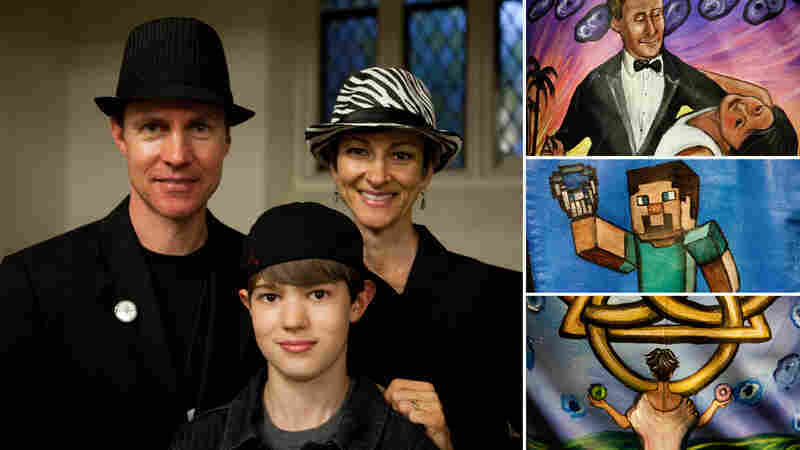 Artist Regina Holliday brings those secret stories to life in her Walking Gallery. Most health policy meetings are a dull gray snooze of business suits talking data. They seem a million miles removed from making sick people healthy. But this week in Washington, D.C., some of those meetings was enlivened by a sudden flash of color. 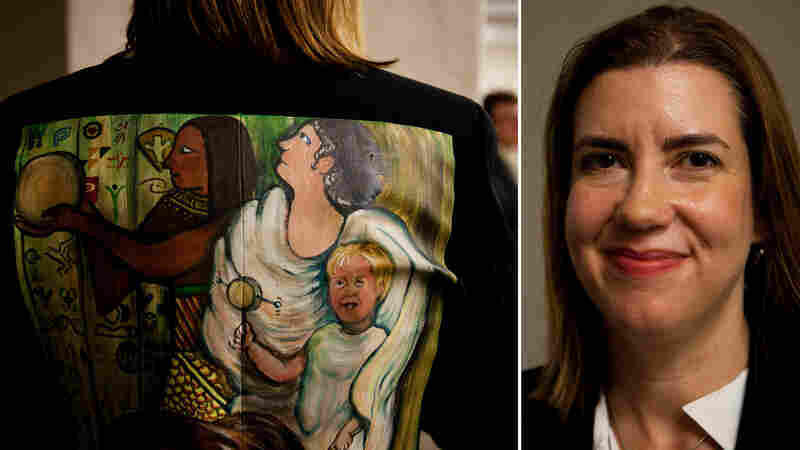 The back of one woman's suit jacket bore a painting, a Renoir-like portrait of a mother and child. A man's blazer showed him reborn after years of despair. 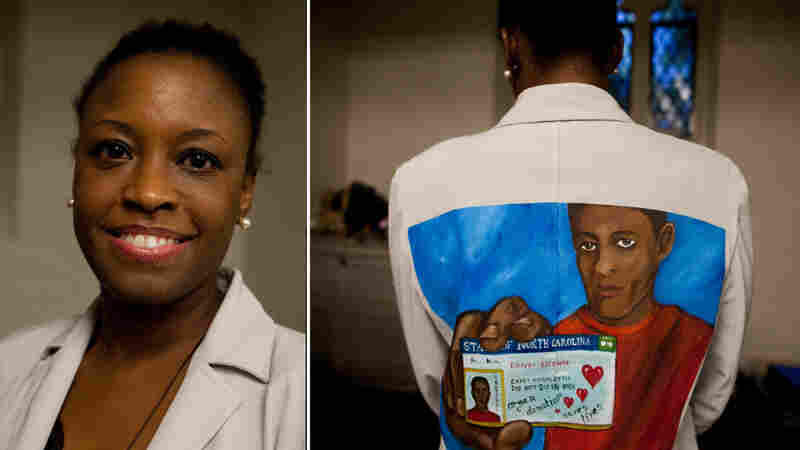 Another woman's jacket portrayed a young man holding his organ donor card. 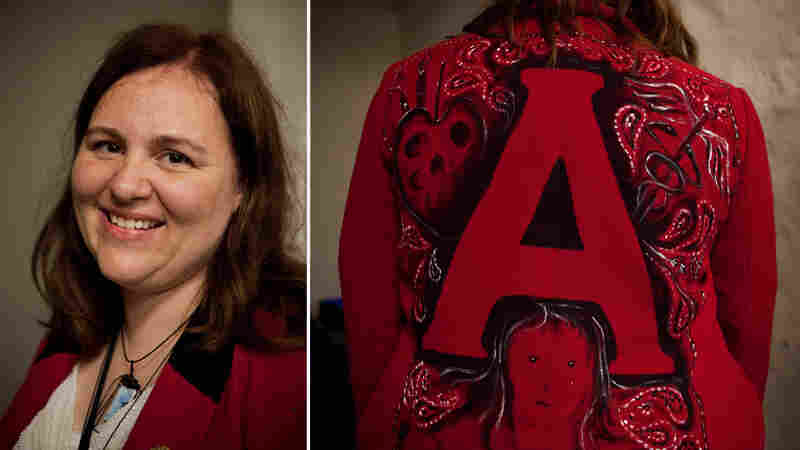 A petite redhead's jacket blazed with a scarlet letter "A." It was an insurrection of sorts, the latest incarnation of something called the Walking Gallery. 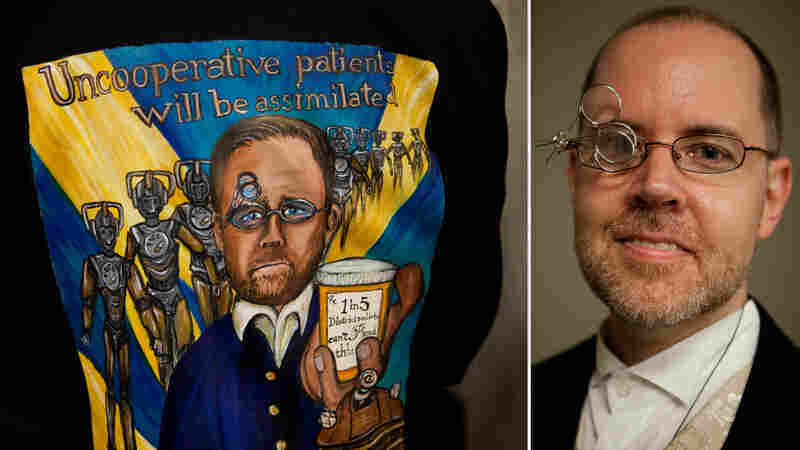 The paintings on the back of jackets tell tale about the wearers' odysseys through the labyrinth of the American health care system. The paintings speak of struggle, frustration and loss. But there's also perseverance, great love and triumph in the face of tragedy. "Twenty percent of adults in Washington, D.C., can't read a prescription label," says Ben Merrion. As an adult literacy teacher with the city's libraries, he's trying to make that possible. One of his students couldn't read that her medication should be taken with food, and had painful side effects as a result. Alisa Hughley's brother Carey Hughley III was murdered at 21 by a person with untreated paranoid schizophrenia. Because she knew that he had chosen to be an organ donor, she was able to convince her grieving parents to approve the donations. "I was able to allay my parents' concerns," she says. "He was able to save four lives." Scott Hamilton was a college student and aspiring major league baseball player. But he died at age 23, from a medication overdose while being treated for testicular cancer. "Jo, you have to tell people what they've done to me. You have to tell them!," he told his sister, Jo Hamilton, before he died. She has done that, in her book For The Love of Scott. Kym Martin has had cancer three times: Hodgkin's lymphoma at age 17, then melanoma and breast cancer. Her "Trinity" jacket reflects how her faith in God has helped see her through. Son Taylor, 12, uses his jacket to remind him to drink water so he won't have kidney problems again. And husband Ross Martin's jacket shows him dancing through cancer treatment with Kym. They met ballroom dancing. Lygiea Ricciardi hoped to have a natural childbirth in the safety of a hospital. When the doula had her wait so long before going to the hospital that she almost had the baby in the car, she discovered how hard it can be to combine high-tech medicine with ancient forms of high-touch care. Mother and daughter are fine, and Ricciardi works on federal efforts to make health data consumer friendly. Meet Gregg Masters, and you see the energetic, upbeat CEO of a health care social media firm. Regina Holliday painted something else: His long struggle with depression, with the scarab beetle clearing away the pain of the past, and the egg symbolizing rebirth. "I had goosebumps when I saw it," Masters says. "She saw that in me. I didn't talk with her about depression." That's "A" as in artist, and also as in "Little Miss A-Type Personality", which is what a doctor called Regina Holliday when she asked questions about care for husband, Fred, as he lay dying of kidney cancer. Gregg Masters has gained control after years of struggling with depression. Lygeia Ricciardi has a healthy, happy child, though her attempt to have a natural childbirth in a hospital didn't work out as she planned. And Alisa Hughley convinced her parents that they should allow her brother's organs to be donated after he was murdered at age 21. As a result, she says, "four lives were saved." The Walking Gallery is the vision of artist Regina Holliday. 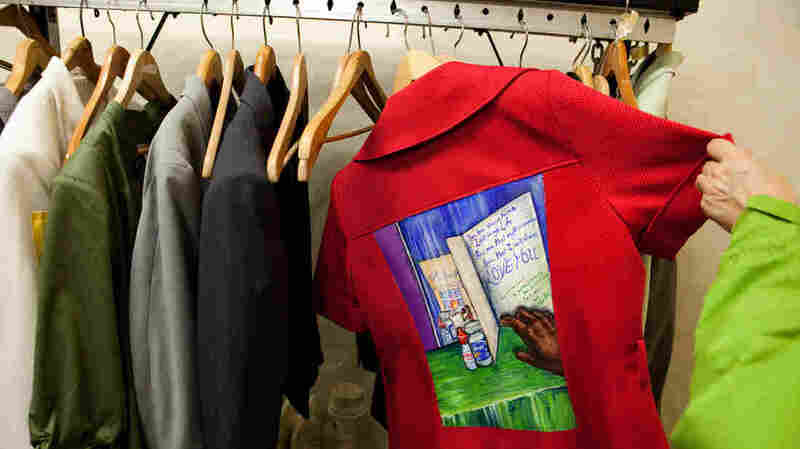 In the past two years she has painted more than 200 jackets, with the owners promising to wear them to health care meetings two or three times a year. Wearers include doctors, health policy types and regular folks. Their jackets tell the stories not just of their work life, but of their personal experiences with health care. "It's your own story," Holliday says. "And it's your own jacket." "I wear my jacket proudly," says Eric Topol, a cardiologist and professor at the Scripps Research Institute in La Jolla, Calif. "It gets people talking about what we can do to get patients taking charge." His jacket shows him standing inside a person's chest cavity while holding a smartphone. He says it captures his passion for letting people use their own medical data. Holliday first applied art to the iniquities of the health care system after her husband Fred died of kidney cancer at age 39. Infuriated by how Fred had been made wretched by inadequate and uncoordinated care in 2009, she painted a huge mural about his death on the wall of a gas station near her home in Washington, D.C. NPR's Joe Shapiro told the story of that mural, 73 cents. As a widow with two young boys, Holliday could have stopped there. Instead, she has become a patient advocate, speaking to medical groups and painting at medical meetings. The idea of painting on the back of business suits came to her as a way to bring the subversiveness of art to the corporate suite. Her own jacket, the one with a scarlet A, reflects both her identity as an artist, and an experience when Fred was dying in the hospital. A doctor was angry that Regina had asked a hospital social worker for help getting paperwork done for desperately needed disability insurance, and that she had been asking questions about her husband's care. The doctor said: "I understand Little Miss A-Type Personality has been asking questions." Holliday is still asking questions, and still painting, including a painting at the MedCity Engage conference this week that included references to Oklahoma, her home state, the deadly twisters there, and one of the organizers' loss of a child in a miscarriage. 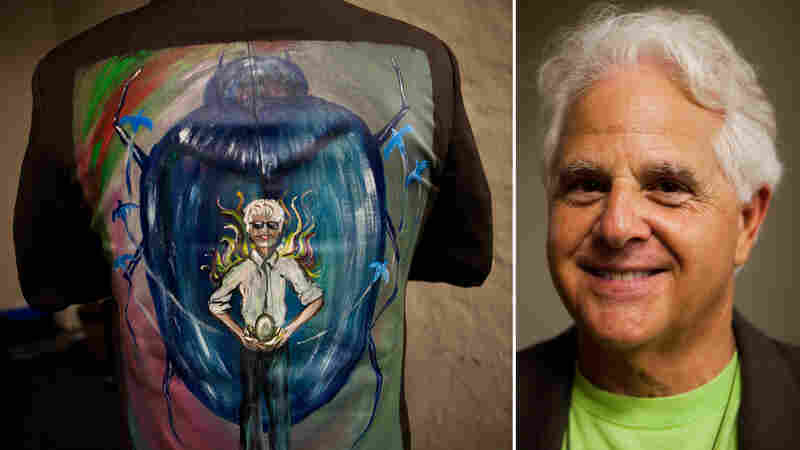 A Medstartr campaign is raising money for a documentary on the Walking Gallery. 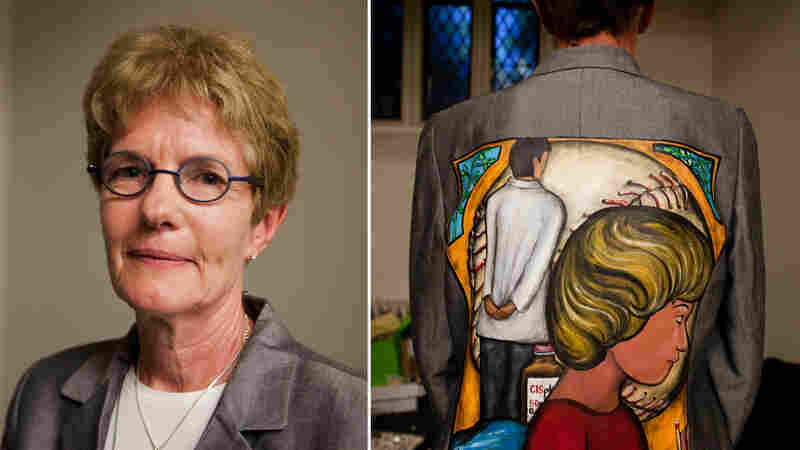 "I know so many patients who suffered in silence while the world turned its back on their suffering," Holliday writes of the Walking Gallery. "Now, when you turn your back on a patient you are actually communicating at a far deeper level, for on your back you portray the patient voice."